Earth, fire, wind, water... it sounds like the beginning of a Captain Planet episode but these are simply the elements incorporated into a new floating house concept. Pitched as a two-storey house on water the Unidentified Floating Object aka UFO uses natural energies to be completely self-sufficient. 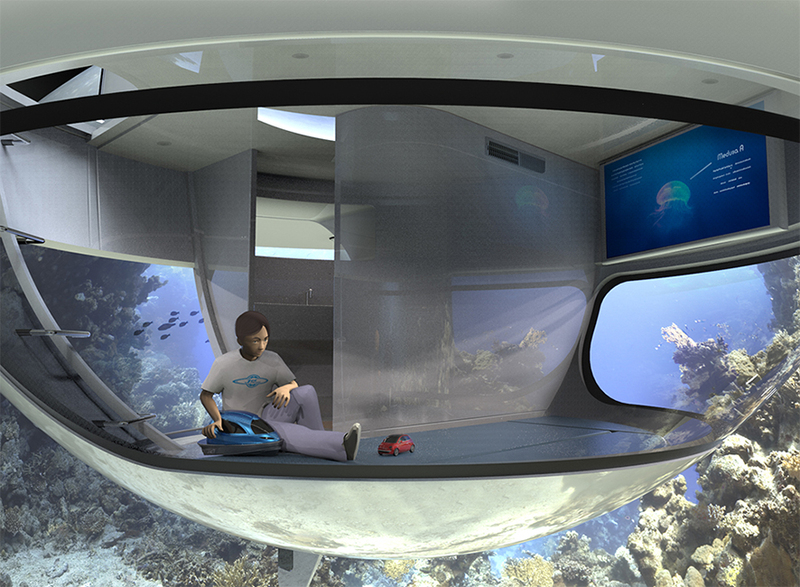 It is designed by Italian start-up company Jet Capsule. Two half-spherical fibreglass structures form a shell surrounded by a disk 12.5m in diameter - mimicking the shape of Saturn. Under the deck can be filled up to 30sq m with photovoltaic solar panels where the sun's energy can be directly converted into the main battery connected to the electric engine. Extra energy resources can be obtained from wind and water turbines above and below the UFO's main disk as pictured above. The captain can select the preferred configuration according to weather conditions. A compass aligns the main compartments of the floating object to the selected cardinal direction, while a bespoke elastic anchor system maintains its position and stability for safety even in rough sea conditions. The interior has a transformable dining area with a kitchen and a sub level accessed via a staircase, which hosts a bathroom and variable seabed view. Inside the height reaches 2.20m. The UFO can get up to an estimated top speed of 3.2 knots with unlimited battery autonomy. The maximum height is 6m and maximum immersion is 2.50m. The design company, Jet Capsule, is looking for an investor in order to develop a first working prototype.